In 2014 the Isaac Newton Telescope became the first telescope in La Palma to discover and secure five Near Earth Asteroids (NEAs) as part of the EURONEAR project and as a result of the allocation of several override programmes awarded by the time allocation committees. The first NEAs discovered using the Isaac Newton Telescope and from La Palma plus one subsequently lost. Six to eight NEA apparitions were combined in the same stellar field. Credit: F. Char, UAUA Chile [ JPEG ]. 2014 LU14 (EURONEAR acronym EUHT171). 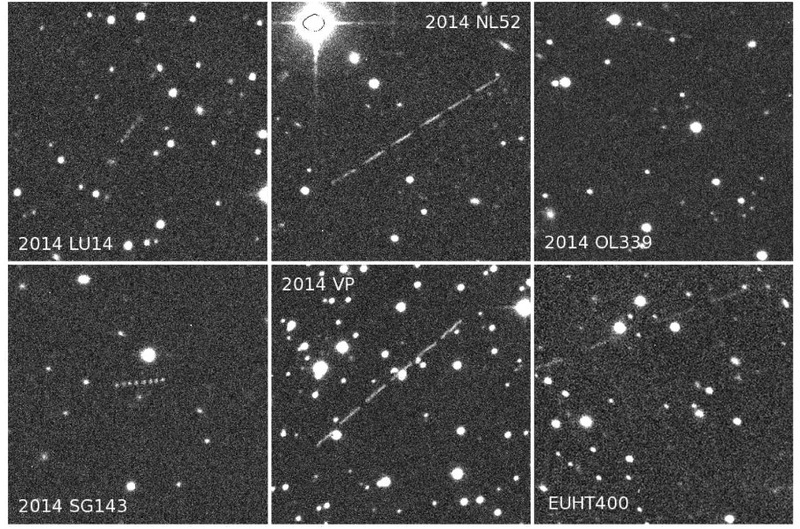 It is the first NEA discovered from La Palma (2 Jun 2014), by L. Hudin (ROASTERR-1 Cluj), who analysed the images, from observations by O. Vaduvescu and V. Tudor (ING). 2014 NL52 (EUHT288). At discovery it was moving rapidly on the sky at 6 arcsec/minute and close to the Earth. It was soon found to rotate extremely fast with a period of 4.5 minutes, meaning that it can be an interesting object to study the evolution and possible fragmentation of small NEAs. 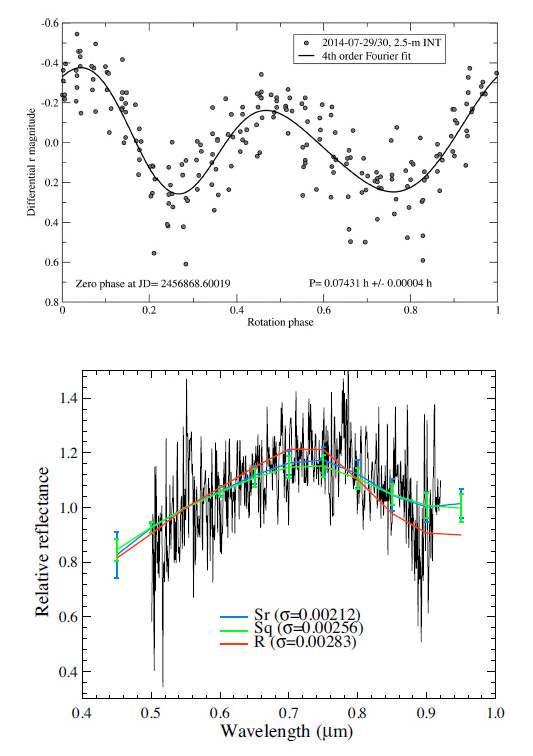 Discovered on 10 July 2014 by L. Hudin (ROASTERR-1 Cluj), from observations by O. Zamora (IAC). 2014 OL339 (EURC061). 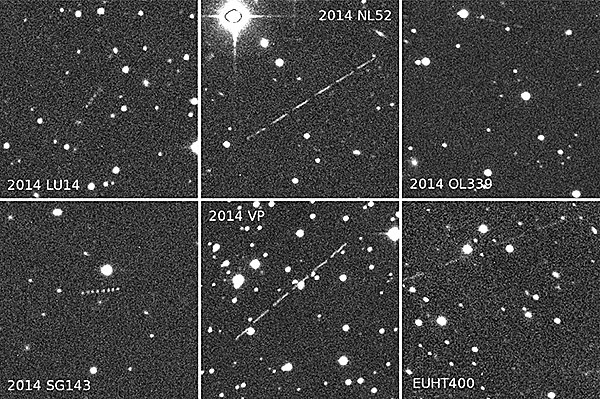 It is the fourth quasi-satellite of the Earth and the first Aten quasi-satellite (C. and R. de la Fuente Marcos, 2014, MNRAS, 445, 2985). Discovered on 29 Jul 2014 by F. Char (Universidad de Antofagasta, Chile) from observations by O. Vaduvescu and V. Tudor (ING). 2014 SG143 (EUHT461). It is a large NEA, size around 1 km. Discovered on 18 Sep 2014 by L. Hudin (ROASTERR-1 Cluj) and observers O. Vaduvescu, T. Mocnik (ING) and M. Popescu (Romanian Astronomical Institute). 2014 VP (EUHR001). It is the brightest EURONEAR discovery (R=19.3). Discovered on 4 Nov 2014 by the R. Cornea (SARM Romania) and L. Hudin (ROASTERR-1 Cluj), from observations M. Díaz Alfaro, T. Mocnik, I. Ordoñez-Etxeberría and F. López-Martínez. Top: follow-up INT composite light curve of 2014 NL52 showing a very rapid spin (P=4.5 min), credit T. Kwiatkowski. Bottom: follow-up spectra obtained using the Gran Telescopio Canarias showing its S-type taxonomic class, credit: J. de Leon and A. Cabrera-Lavers. Extracted from MNRAS, 449, 1614. [ JPEG ]. The Isaac Newton Telescope equipped with the WFC remains a very powerful tool in NEA research and survey work. Based on these statistics recently published by the EURONEAR team, one NEA could be discovered in good conditions in 3-5 square degrees, covered by 12-20 WFC pointings, requiring 3-4 hours. During about 50 dark nights, the WFC could take European leadership in NEA survey work, being capable to discover more than 100 NEAs. O. Vaduvescu et al., 2015, "First EURONEAR NEA discoveries from La Palma using the INT", MNRAS, 449, 1614. Paper. The EURONEAR website, including animated images and orbits of the discovered NEAs.